c1964 Meazzi Factotum System, courtesy of "Blueglassman", UK. Both these units came equipped with tape-echo, and they were intended to replace the miscellany of old theatre units, Hi-Fi amps, and converted guitar amps that were used by UK groups in the early 1960's for amplifying the efforts of their vocalists. This Italian manufactured unit was introduced into the Selmer amplification range in late(?) 1962 at the not inconsiderable price of 175gns. Initially it was supplied with twin Meazzi speaker columns, with 6No. small 4" speakers per column. Apparently, these speakers were not up to handling the (rather modest) power of the Factotum, and Selmer were receiving too many warranty claims. From mid-1964 therefore, Selmer supplied their own 4 x 8" columns, the TV/4/8, with the Factotum in place of the Meazzi units. The basis of the Factotum was two independent amplifiers of 18watts each in the one casing, giving a total output of 36watts. Valves employed were 2 x EZ81 rectifiers, 5 x EL84, 6 x 12AX7, and 1 x 6AT6. Fan cooling of the valves was provided - quite a sophistication in 1962! The most important feature however was the built in Meazzi Echomatic tape echo unit. This six replay head unit was a later tape-loop version of the Meazzi Echomatic magnetic-drum machine that had been used by The Shadows to create their magnificent sounds on such records as "Apache", "FBI", and "Frightened City". The first Factotum sold by Selmer had a vertical control panel set in the front of the amplifier casing, with a clip-on protective cover. This was changed to a horizontal panel at the front half of the casing with a hinged protective cover, in 1963. In the later part of the1960's, the Factotum was changed to a transistor-powered amp with first a 2 x 20watt output, and then finally to 4 x 20watts. It seems to have dodged in and out of the Selmer catalogue until about 1971. Introduced in early 1963 shortly after the Meazzi Factotum, no doubt in direct competition to the Italian unit, the Swissecho PA amp was manufactured by Uniton AG in Switzerland. A valve driven 2 x 18watt amp, again this heavily featured a tape-echo (Swissecho) effect. Four inputs were provided, each with individual volume, treble and bass controls. 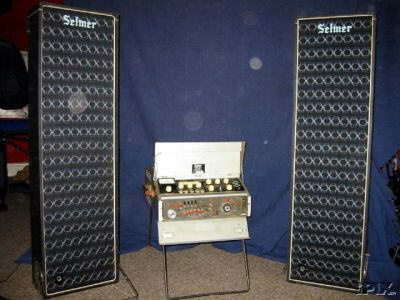 The Swissecho Deluxe was sold only as an amplifier unit by Selmer. Initially, two Truvoice 61 Sound Cabinets were suggested in the March 1963 catalogue as being appropriate for use with the Swissecho. During 1964, the Deluxe disappeared from Selmer's catalogue (although the tape echo unit continued on for a year or two). The Meazzi had won the battle! As a matter of interest, Uniton also manufactured a 50w Amplifier head, intended for both guitar or bass use. This has a very similar appearance to the Swissecho tape-echo unit. This amp was not distributed by Selmer, but it was badged with the Hofner label for sale on the continent of Europe.